The NAB show 2018 certainly felt like the year of past reflection and future promises. Panasonic celebrated being 100 years old with a string of new releases at the show and many exhibitors displayed future technology roadmaps featuring artificial intelligence. AK-UC4000 camera. This 4K, HDR, high-speed studio camera boasts 4.4K native resolution and high-speed 240fps capability. 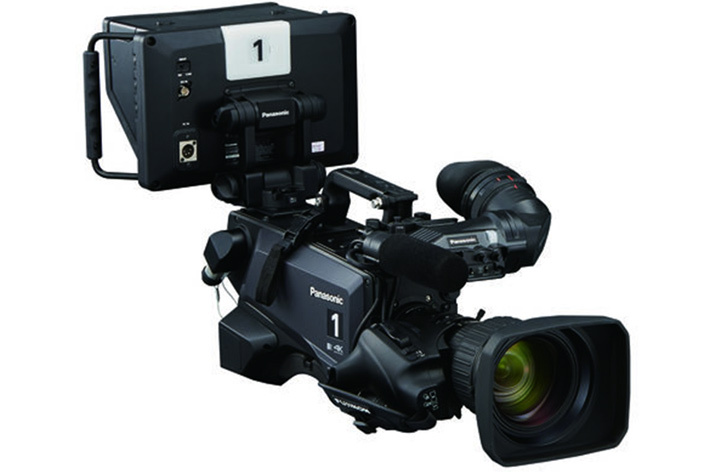 The AU-EVA1 cinema camera got a free firmware upgrade which enhances its recording capabilities with RAW data output. There was a new AV-HLC100 Live Production Centre with Network Device Interface (NDI) that combines a 1 ME switcher, remote head camera controller, overlays for graphics, recording streaming and audio mixer functions to enable single person operation. Shooting Partners are commencing testing on the new Panasonic Broadcast-Grade 360°/VR Live Camera, the AW-360C10, plus the new POVCAM/AG-UMR20 / AG-UCK20GJ 4k minicam this week. Sony launched new cameras at the show as well as showing their latest version of XDCAM AIR. The FS5 MKII follows a similar approach to the evolution we saw with the FS7 camera previously – small tweaks that can make a big difference. Constant high frame rate recording (so no more buffering to get 120fps) and 4K RAW (up to 60P) acquisition is now included at a reduced purchase cost. The upgrade is expected to be released in June 2018. Other new cameras featured at the show were the Sony Z280 & Z190. Interestingly, both cameras have all-new 4K 3CMOS three-sensor configuration as opposed to the popular single-sensor route that Sony (and other manufacturers) have used for some time. The benefit of multiple sensors is better colour reproduction and also a particular ‘look’ that some users prefer. These two cameras certainly feel like a jump forward for the single shooter faced with a ‘run and gun’ news-style scenario. These two cameras certainly feel like a jump forward for the single shooter faced with a ‘run and gun’ news-style scenario. 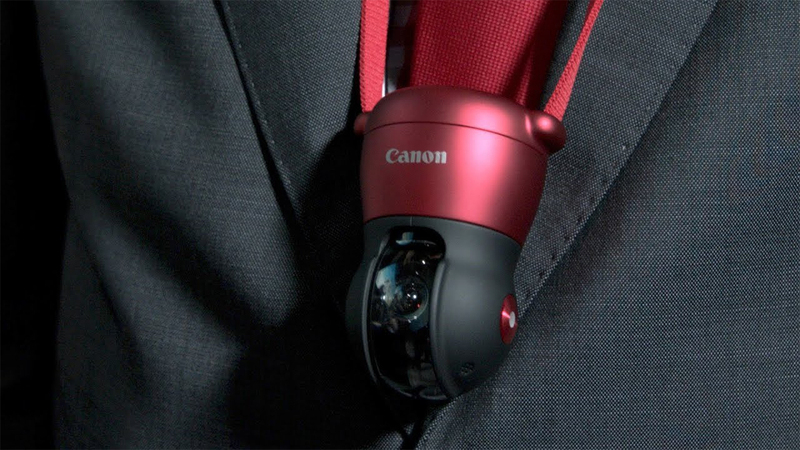 Both cameras provide great 4K pictures, fantastic interfaces for audio (through the two MI shoes,) face detection and auto focus (to keep your subject tracked and, crucially, in focus whilst on the move,) networking connectivity through two USB ports and S-Log3 (providing High Dynamic Range.) Availability is forecast for May 2018. 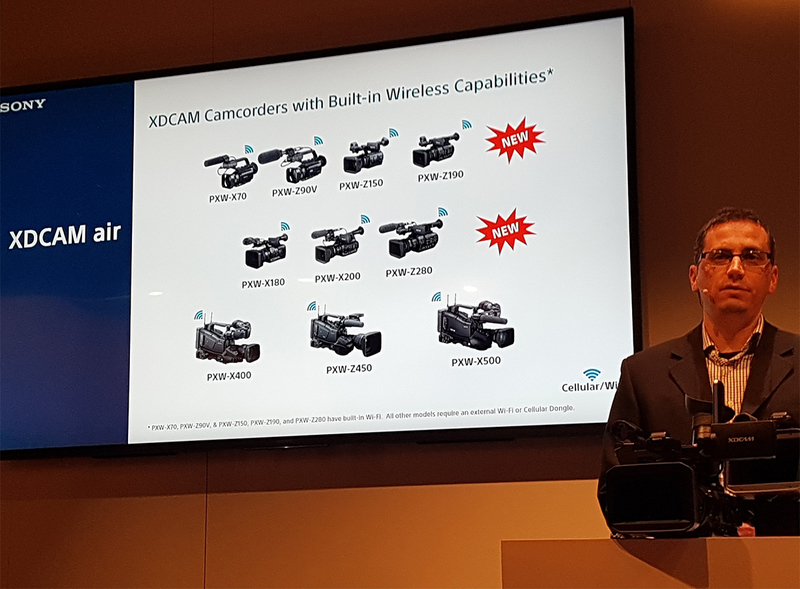 XDCAM AIR is the camera-to-cloud technology that has been bubbling away under the surface for the past three years and is now maturing nicely. 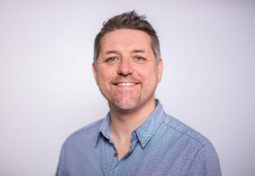 The software can stream video from the camera straight to the cloud where it can be viewed and logged using either Sony’s proprietary Ci software or a third-party option. New features include streaming to social networks (boasting only a 1.5 second delay) and a virtual switcher / vision mixer – also based in the cloud. With a number of productions using this technology under our belt, Shooting Partners is excited to roll it out further this year. 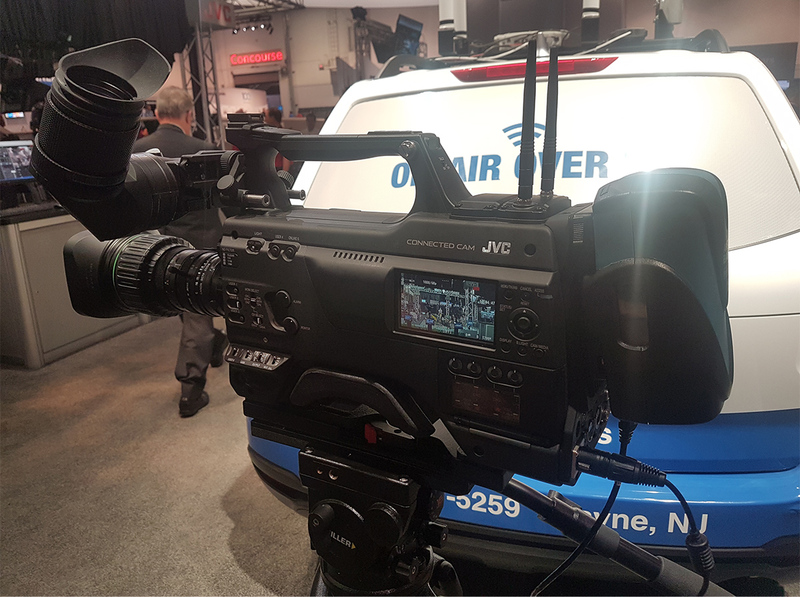 A great surprise at NAB 2018 was the JVC GY-HC900 CONNECTED CAM. 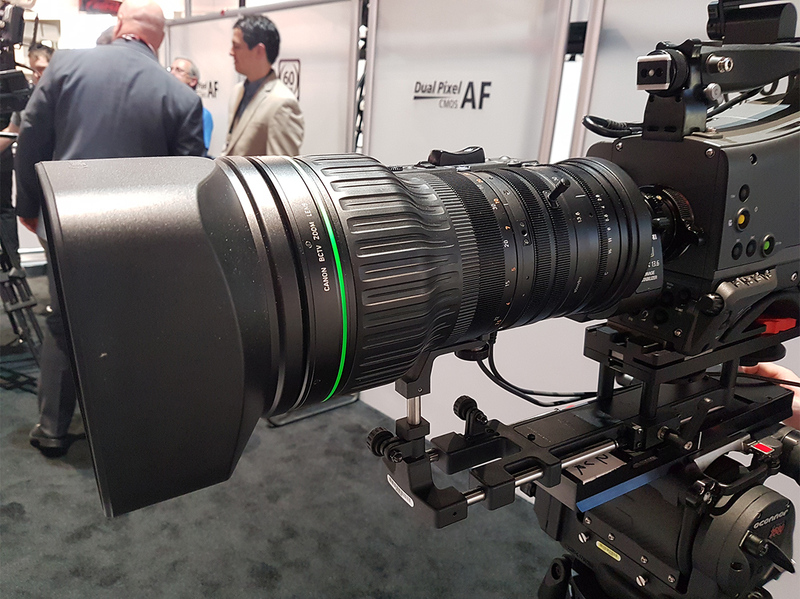 The product won the Best of NAB 2018 award and, like Sony’s XDCAM AIR, is focused on camera-to-cloud technology. The camera is a shoulder-mount-style 2/3-inch 3xCMOS sensor camcorder with HDR capability. The great feature is, of course, speed to air. 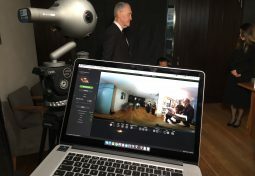 The system uses 4G and Wi-Fi in conjunction to, not only send video and audio to cloud-based servers, but a return feed (perhaps from a studio) back to the camera. This also includes comms over IP, so the camera operator can take direction. Perhaps a serious contender against the Sony cameras? We can’t wait to try this out! 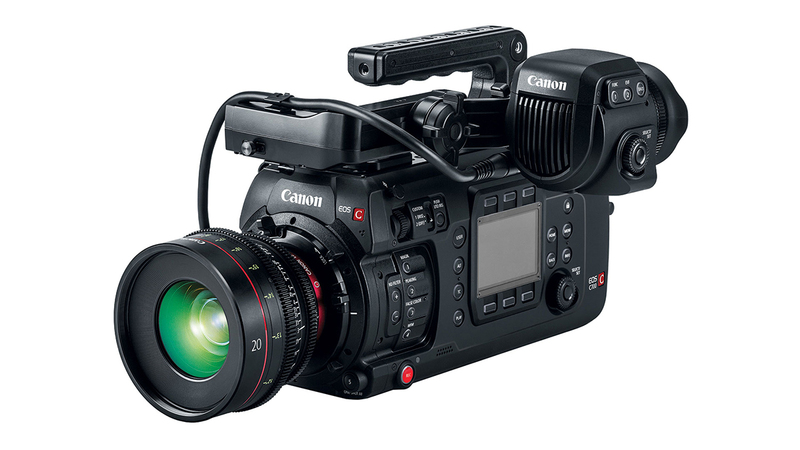 Canon continued its assault on the higher end of acquisition by debuting the C700 FF (full frame.) The form factor of the camera is the same as the existing Super 35 C700, so all accessories will be compatible, but with an all-new 5.9K sensor installed. If you are a C700 owner already you can have a sensor swop out in the near future, but pricing is yet to be announced. Canon also showed an interesting prototype called the Intelligent Compact Camera (perhaps not the final product name) which, for such a small size, crammed in some great features. 360-degree rotation (much like a mini PTZ camera), intelligent face or object tracking plus good quality video make it one to watch for mini cam work, fixed rig or even behind the scenes content. Release date and final specs TBC. One other notable release is the new Canon 4K 45×13.6 lens. More information will follow, but at first glance this looks to be a natural 4K replacement for the long serving HJ40 lens category. 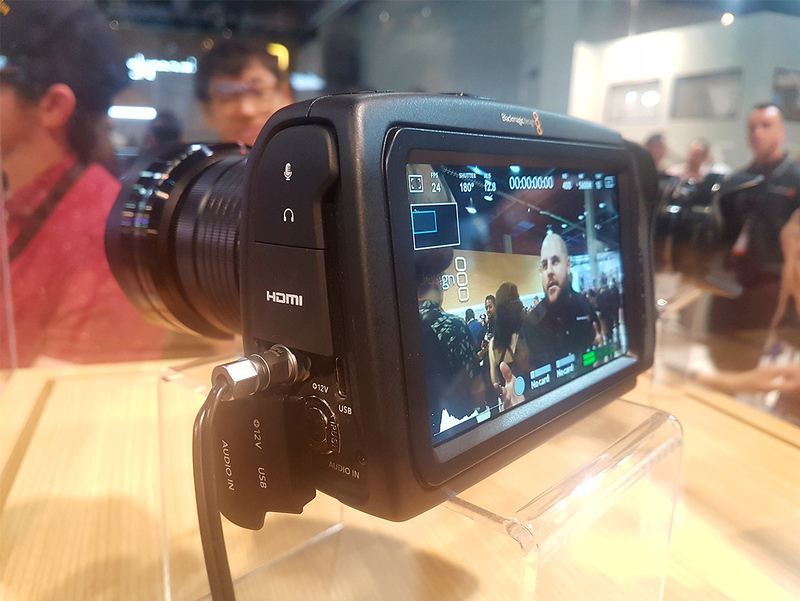 Black Magic Design attracted a huge amount of attention with the surprise announcement of a new 4K Pocket Cinema Camera. The excitement was started due to the camera being priced at around £1,000 and was heightened by the fact that the cost includes a full DaVinci Resolve licence (worth around £300.) The camera boasts an all-new Micro four-thirds dual native ISO sensor which, upon first look, seems to have great low-light capability. Recording is either RAW Cinema DNG or ProRes, (which would suit many workflows) and 4K up to 60 frames per second. We are really happy to see a removeable battery on this model, following issues with the previous Pocket Cinema Camera, as it promises up to one-hour record time per battery. The camera is expected to ship in September 2018. One prototype demonstration that certainly felt like a leap into the future was Google’s ‘Welcome to Light field’ camera / tech. Google’s aim in using light field photography is to capture more realistic scenes in a virtual reality setting. Light field photography doesn’t just capture the light that comes straight in through a camera’s lens, but also captures all the rays of light from a scene, as well as information about where they came from. This means you can reassemble those light rays to create an interactive picture. Google placed the imagery into a VR space so that, when you move your head, you can see around the corners of close objects. This has the effect of adding realism to virtual reality. 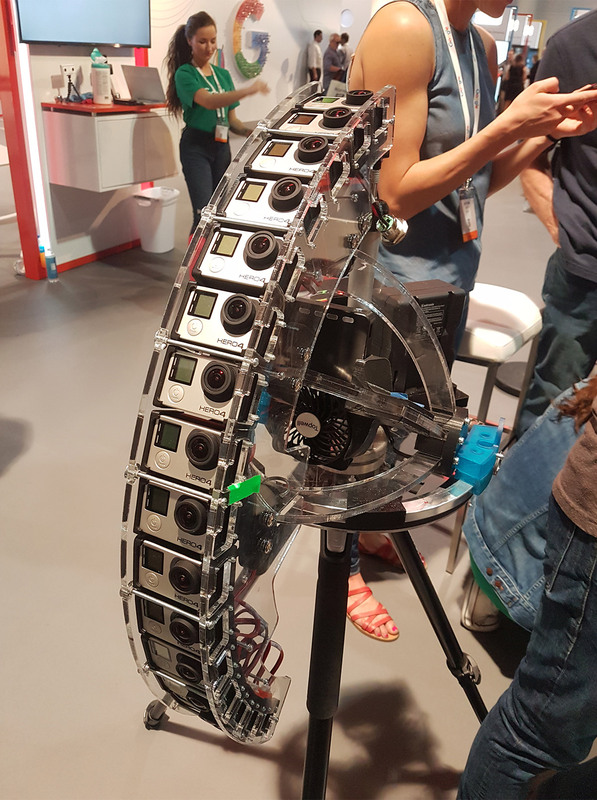 Google’s prototype is made from a spinning rig holding sixteen GoPro cameras in an arc. This arc is then adjusted down by the exact space between two lenses and spin again which doubles the sixteen cameras to thirty-two. This appeared to be borrowed from Google’s existing 360 rig and system ’Jump’. The “Welcome to Light Fields” app offered great examples of content created with Google’s prototype across a few locations, including the flight deck of the Space Shuttle Discovery, a church scene with extremely realistic rays of light coming through stained glass windows and various scenes with mirrors or reflections. We tested the Google demo app with the HTC Vive headset at NAB 2018, but we understand it will also be available on the Oculus Rift, and Windows Mixed Reality headsets. 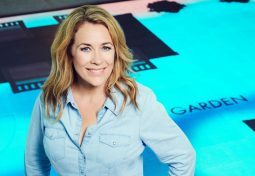 Our feeling from NAB 2018 is certainly that content consumption is changing far more rapidly than anyone predicted. The speed of consumption also appears to be ramping up. There were many OTT (Over the top) content providers at the show with some startling news and facts on viewer behaviour. 2017 saw a record level of “Cord Cutting” – the trend of customers cancelling their standard TV subscription service in favour of OTT services such as Netflix, Amazon Prime etc. Vimeo announced at the show that their subscription service will soon be live-streaming. According to Netflix 35 million people cancelled subscription TV services in favour of OTT through 2018. Netflix now has 120 million subscribers as of Q1 2018, they boast over 13,000 titles and are on course to publish two pieces of original content per day in 2019. 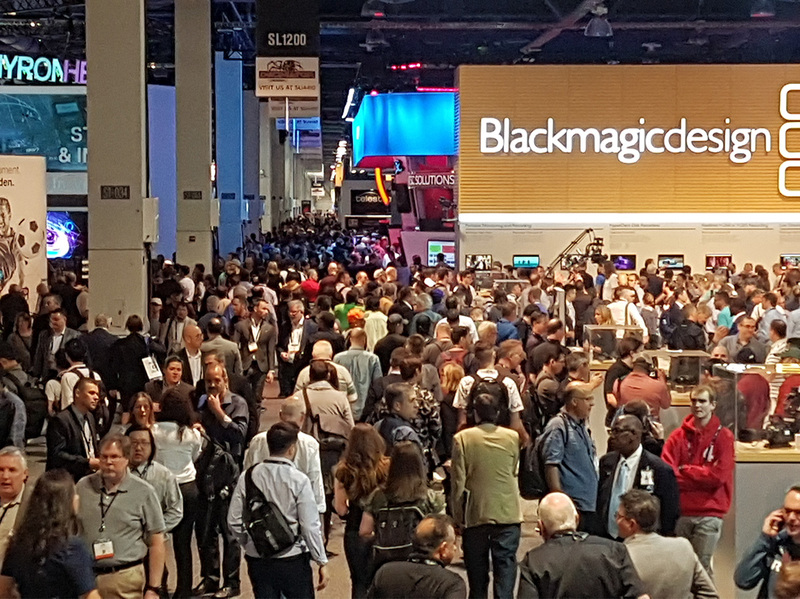 NAB 2018 felt like a mixed year where some new technologies emerged, and others matured. The thirst for new technical solutions shows no sign of stopping, but technical innovation can’t necessarily keep up with the demand. Technologies such as Artificial Intelligence, Virtual Reality and Camera-to-Cloud have been around for quite some time, but most of them weren’t available as a neat package, easy to use or at the right price point for most content creators. Progress has certainly been made on all fronts, so the uptake should see an increase. There is a ferociousness on the adoption of new technologies that borders on hysteria. Many visitors to NAB ask questions of new tech such as “Is this the new 3D? will it be here and gone quickly?” We believe that some great technologies need time to mature and grow into a great option. Be patient! It is unclear what the next big leap in acquisition technology is. Resolutions get higher and higher – so much so that they exceed what the human eye can actually see. We will continue to research and assess with great interest through 2018. Get in touch to find out more about the latest developments in acquisition technology.